SS&C Advent Hitting a technology roadblock? 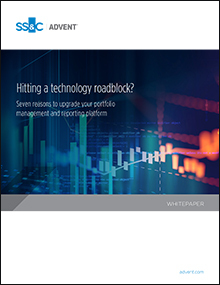 This paper points out the perils for investment managers of sticking with outdated technology. New technologies, particularly those that seamlessly and purposefully share data, present enormous opportunities for efficiency and enhanced client experience. (c) 2018 Advent Software, Inc.